We are so close to our goal!! We have one day left to raise $827. so I can inspire people on my tour this summer. Will you help us? 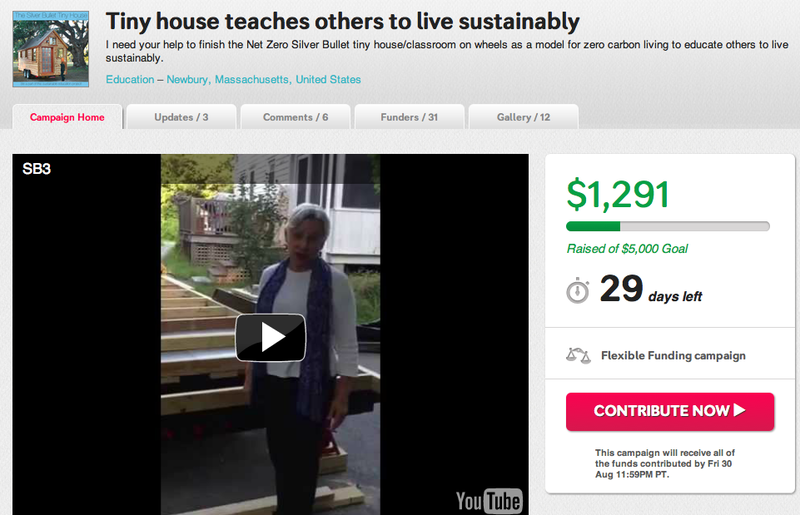 Can you help us get out on the road to teach others about living sustainable lifestyles? We will be leaving Massachusetts on June 1st and travel across the country to many ‘Pop UP’ stops at private and public locations. In order for us to fund this tour, we have started an IndieGoGo campaign. Please consider donating what you can and pick your reward here: http://bit.ly/1TVPrv6. I need just a little more of your help to complete it! Every dollar will help us along our way! We finished The Silver Bullet Tiny House last fall and we are now ready to hit the road. Can you help us? If you are not able to contribute, you pass the word on to those who are interested in sustainable lifestyle education for all Americans. I temporarily stopped building the sustainable Silver Bullet Tiny House Classroom* on wheels to take a month off to attend to two things. First, I ran an IndieGoGo campaign to raise funds for the remainder of the exterior and am happy to report we raised about 60% of our goal. My gratitude goes out to all my supporters and I’ll be back to building next week! And secondly, I assembled all the upcycled artwork that I’ve been creating over 14 months. So mark your calendar because the art reclamation show opened today! The opening night party is September 20, Friday 6-8PM. You are all invited. Over the last two years I’ve become obsessed with forging a sustainable tiny life and building a tiny house. I’ve drawn countless tiny house designs, electrical drawings, elevation sketches, and collected windows, doors and materials from Habitat for Humanity, the side of the road, yard sales, you name it. While in the process of getting ready to build the Silver Bullet, I have been very busy downsizing, recycling, repurposing, gifting, free cycling, and making art out of all sorts of materials. I’ve made cardboard wingtips, beautiful jewelry, toys, bustiers, skirts, shawls, purses, pyramids, chandeliers, musical instruments, paintings and sculptures out of recycled newspaper, plastic bottles, feathers, silk, buttons, beads, ribbons, doors, canvas, yarn, bottle caps and more. I had great fun inspiring an excited group of local high school students to contribute an entire grid of small paintings of their own waste streams. Come and join the party on Opening Night! See you there! * 50% of all the show’s proceeds will go to supporting the Silver Bullet Tiny House construction; the sustainable classroom on wheels that will tour the country in 2014. We launched our Indiegogo Campaign last Friday to fund the completion of our exterior structure of the sustainable tiny house/classroom we call the Silver Bullet. 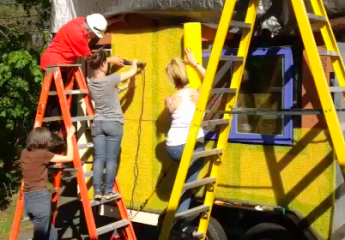 Here’s the thing, the sustainability non-profit I started, terrabluteams.org, wants the Silver Bullet Tiny House to tour the country in 2014 to inspire individuals, families and communities to live sustainable lifestyles. Any chance you or a friend could help us do that? Any donation, no matter the size, would help! Check out our creative perks and pass on the link to others!